Many planes have stopped supplying blankets for passengers. 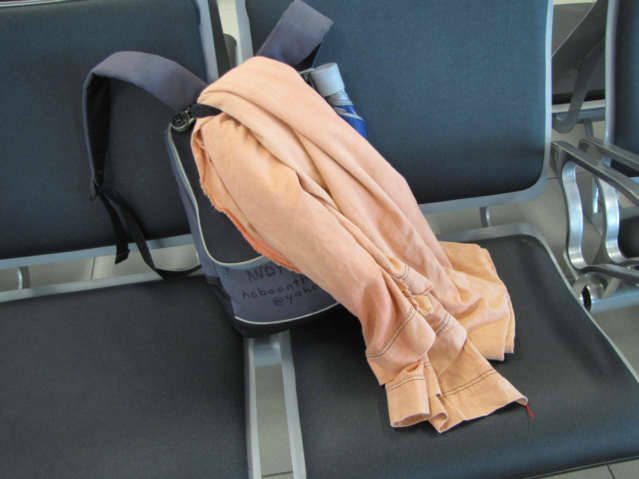 I have carried a blanket onto the plane for the last ten years, with all the new Low Cost Carriers entering the market; this has become a need, not a want. There is nothing worst than feeling cold for 1-15 hours on a plane. This is my travel blanket, I purchased a Hammock in Thailand made of heavy cotton, I use this daily for a blanket in my Hotel room, and once or twice per year for a hammock. This is a multiple-use-gear item I carry; there are many uses for a Hammock that is the simple design, not the complicated designs. I have actually shared this blanket with passengers on airplanes when the passenger next to me was freezing. Note that me running it through the strap of my computer-camera bag keeps me from forgetting it and allows me to carry without effort. I also recommend you use this on buses and trains.